High Fiber—No Term Limits for These Chairs! 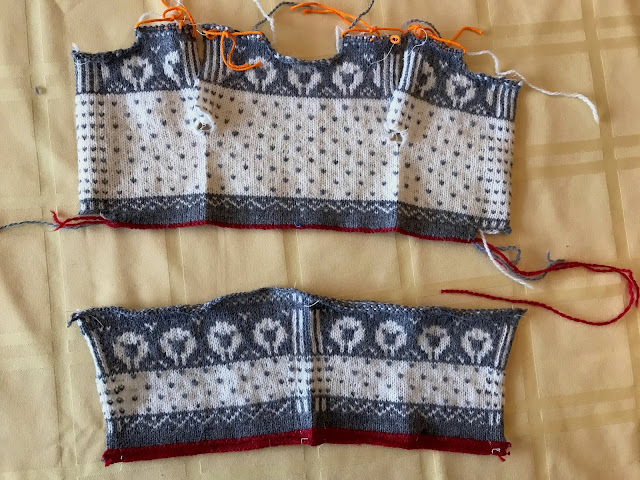 Mandy's Stavanger (Norwegian) Cardigan is finished. The pattern is available for free here. I frogged the front bands twice before I finally got a version Mandy and I liked. It's designed to teach steeks with a different kind of front steek finish and an option for knitting both sleeves together separated by steeks, and then seaming them before sewing them in place in the armholes. In other knitting news, I did a test knit for a doll-sized messy bun hat. I think the designer plans to make it available to the public, and when that happens, I'll provide a link. I used Knit Picks Comfy Worsted in Peony. It took 21g, which is about 46 yards. I wish I could say I picked it because of its excellent stitch definition (which it has), but it was nothing so logical. It was one of the few worsted-weight yarns not yet packed up for the upcoming move. The only things color-coordinated in Lotte's outfit are her hat and slippers, and they don't really match, nor do they go together by function. However, it was what she was wearing, and she's cute anyway. Vintage Stitchers met at Marilyn's on Thursday. I was hand-quilting my Spring Flowers Quilt. As usual, most of the ladies were sewing bindings on. Carol was sewing the binding on this sampler. 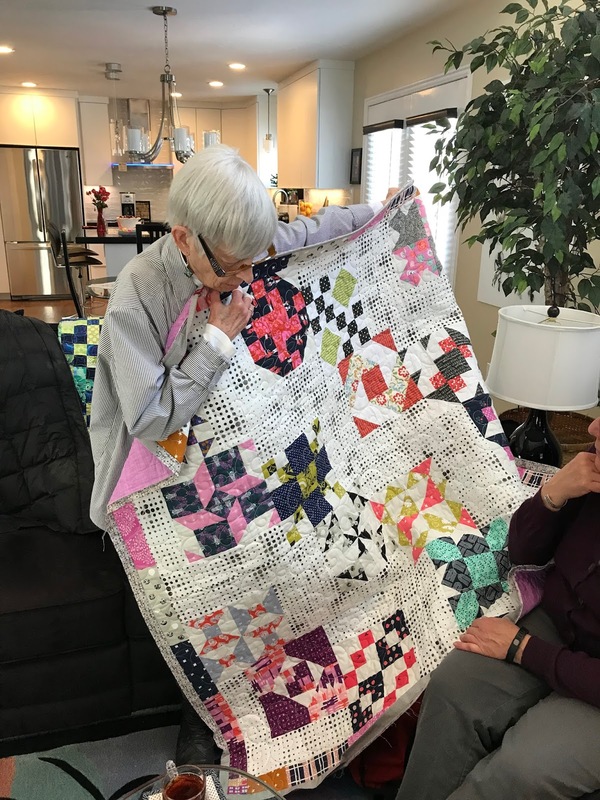 Her quilts are always fun. 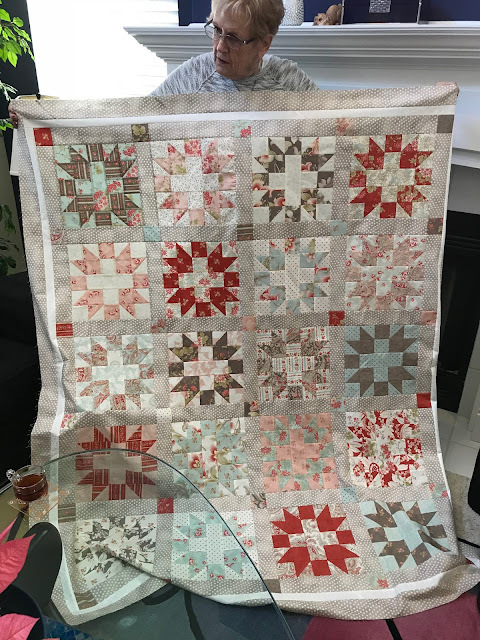 Barbara had this beautiful quilt she made from precut 2 1/2" strips and 10" squares. She's had the fabric for a long time, she says. Marilyn brought out a big bin of yarn she wanted to get rid of. I was good; I didn't even look. I had just dropped off a big load at Saver's, the thrift shop close to Marilyn, and it was fresh in my mind. I have saved out about two years' worth of yarn just to get me through the time until I can open my boxes again. I really shouldn't be adding to it. When Vintage Stitchers was almost over, I received a text saying that the chairs were done. We had dropped them off at Wardell Upholstery in Salt Lake City to be reupholstered in leather. We had to take them down to Salt Lake one at a time, because our car wouldn't hold both of them at one time, so since I was already there, I went by to pick it up. Here's what I saw when I got there. Our lovely daughter and our lovely DIL holding our adorable grandsons at Christmastime 2012. The photo doesn't show the shredded canvas upholstery behind the headrest, and the cracked leather doesn't really show up much, either, but it will give you an idea. I never liked the off-white, and I love the new caramel. I'm thinking they will look good with Mandy's Stavanger Cardigan. 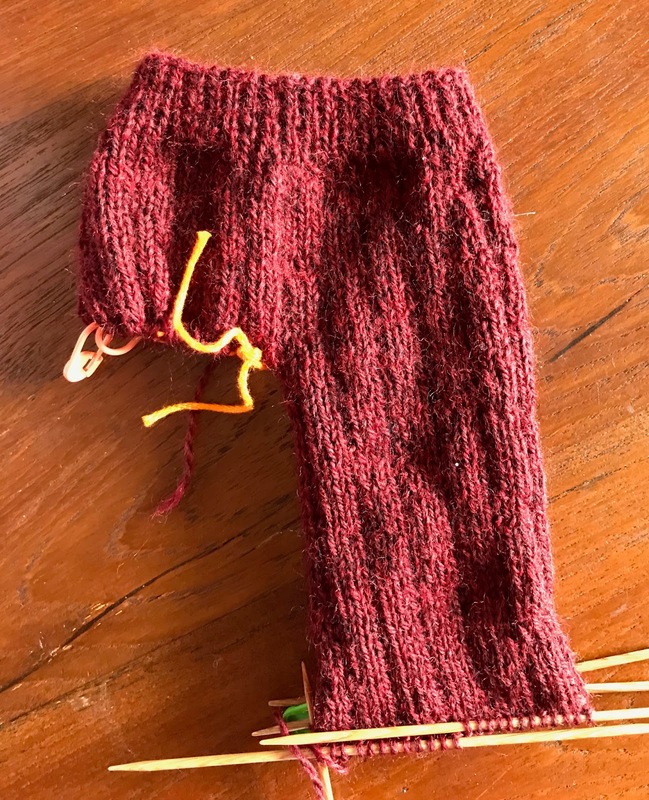 What's on my needles: Mandy's Winter Sports Pants. What's on my Featherweight: Nothing right now. What's in my hoop: Spring Flowers quilt. What's on my iPad/iPhone: I gave up on The Weight of Silence by Heather Gudenkauf for now. I may go back to it later. I wasn't really in the mood for depressing, unhappy characters. Now listening to Miss Tonks Turns to Crime by M. C. Beaton. I really enjoy her books, and I have just discovered that she's a very prolific writer. My only complaint is that they tend to be short and they still cost just as much in credits. On my Kindle app I finished Miss Braithwait’s Secret by G. G. Vandagriff. It was an interesting story. I've listened to another of her novels and found that one to be better. It could be because I would rather listen than read. I haven't picked a new Kindle book yet. What's in my wine glass: Terrain Vineyards Red Blend 2014. Excellent! What's my tip of the week: When packing for a move, pack heavy items (like books or fabric) in smaller boxes so they won't be too heavy to lift. A few heavy items can go in the bottom of a larger box, if you fill it the rest of the way with something light, like down jackets or yarn. Be sure to write on the box with specifics about what is in the box. Gorgeous sweater, of course, and the chair looks perfect too. I did not know about the packing of plates. I also do not have plans to move again either. That’s a great moving tip. I learned that years ago while watching professional packers. The natural thing is to stack the, but they’re stronger on end. 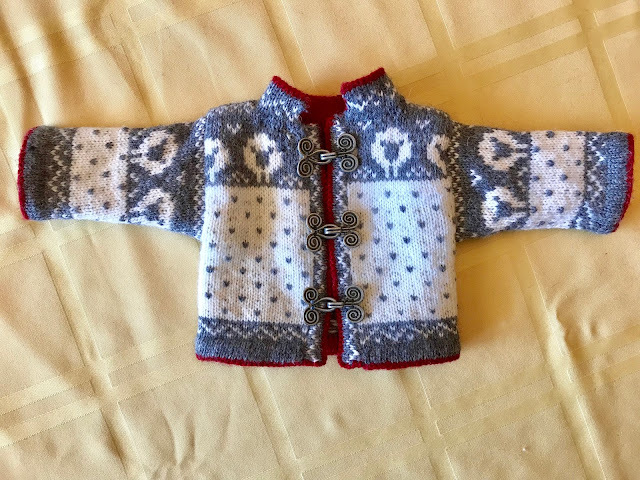 The Norwegian sweater is to die for! What a lucky little doll she is to have a (mommy) who knits such beautiful things. 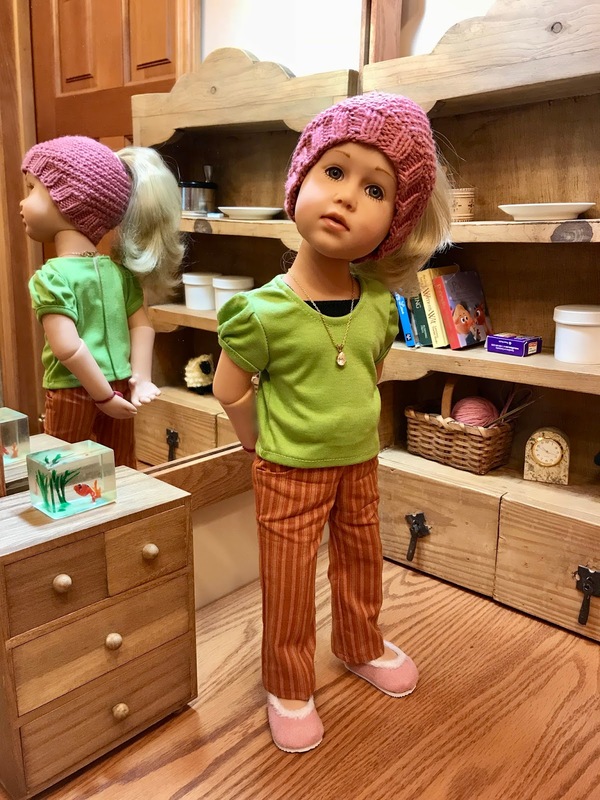 Great blog post as always Peggy. I have a hint for packing too - courtesy of my daughter who's husband has a moving company. When packing dishes, wrap the plates separately in packing paper, and stand them on edge in the boxes rather than stacking them one on top of the other. Irene, we're planning to move to Bend, Oregon. My BIL moved there over a year ago, and he's all alone. Our youngest child and his family live close to Portland, just a few hours away. We aren't getting any younger, and Bend has less snow than here and less rain than Portland. Where are you moving to Peggy? 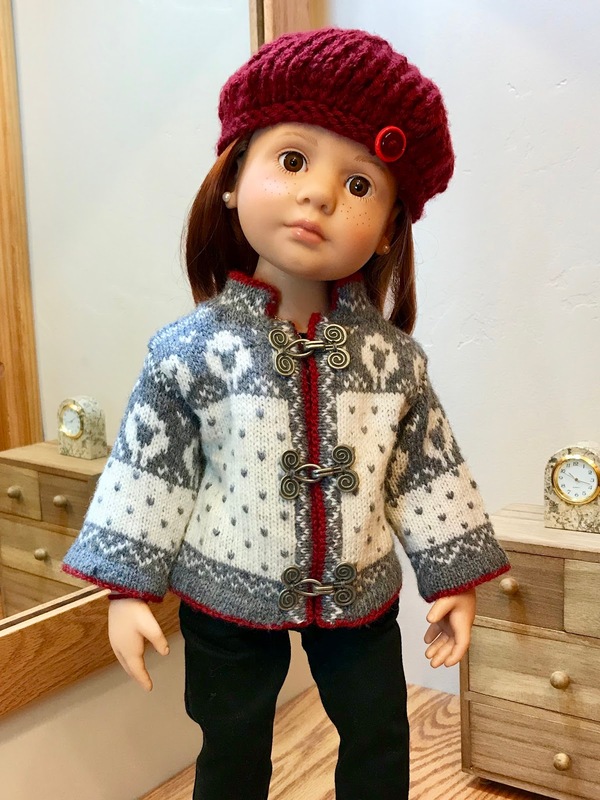 Peggy - those sheep are adorable on the sweater and I especially like the contrasting trim. I've done some reupholstering, and it always looks like it should be easier than it is. I can relate to his sentiments, but maintaining quality furniture is worth it. Thanks, Irene! At the time we bought the chairs, the options were black and off-white. I didn't like either. We have a burgundy sofa, which I have never liked, but I think we're leaving that behind. I envy Mandy having that beautiful sweater and I love the hat with the hole for a pony tail. You are so clever with those knit needles. The ladies quilts are beautiful. 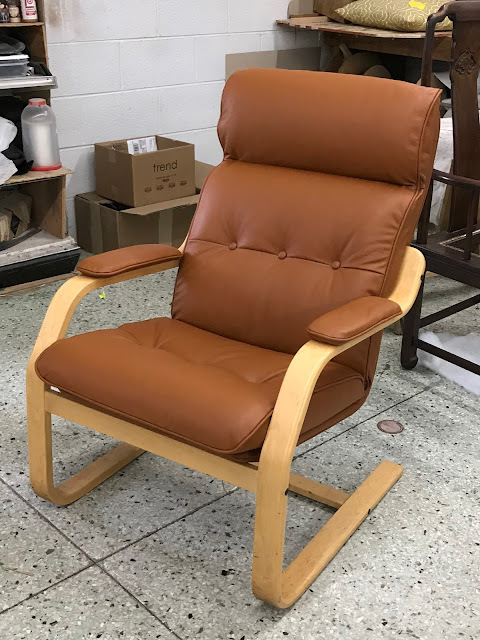 The chair looks great. I too like the darker leather better.